All eyes are on Augusta National next week and his bid to win a fifth Green Jacket at the Masters Tournament. The stage is set for one of the all-time great Masters, with so many of the world’s elite peaking for the first major of the season. Woods caused some controversy recently when he cried off injured during the final round the WGC-Cadillac Championship at Doral, but the former world no. 1 put paid to the predicable speculation about his general health by participating in the Tavistock Cup team event and then showcasing his well-being and excellent form at Arnold Palmer’s Bay Hill tourney, which he has now a record won seven times! This was the Woods of old: with an armoury of shots on command and a greater confidence on the greens than recent form would have suggested. To be fair, he was helped by the poor start of playing partner Graeme McDowell. The 2010 U.S. Open champion opened the final round of the Invitational with a nasty double bogey, thus increasing Woods’ lead to three, and the American was away, never to be caught. Anything that GMAC threw at him, Woods was more than able to match. A two-horse race gradually turned into a one-man show. Woods was back, and boy did he look relieved to get this hurdle out of the way in the way that he loves, letting his clubs do the talking. He is now back up to sixth in the world rankings, his odds to win the Masters have reduced and he is the bookies' favorite. Quite a turnaround from the clearly despondent figure who missed the cut by some distance at the final major of 2011. The naysayers and doubters were shouting from the rooftops when Woods fired blanks at the PGA Championship in Atlanta last Augusta, and many had started to write him off as a slew of players in their twenties started to show their teeth in the biggest events. The Tiger factor looked like being a thing of the past, as youngsters like Rory McIlroy, Keegan Bradley and Charl Schwartzel grasped their opportunities at elite level. With Nicklaus’ record of 18 major victories seemingly out of reach for the newest golfing resident of Jupiter, Florida, all eyes have become more rigidly focused on those who represent the Tiger generation. However, Woods' play at Bay Hill confirmed his status as the man who truly pushes the needle in terms of TV ratings, and his smile as the final putt went down showed to the world that he is where he needs to be: healthy and happy - and in pursuit of his deep-rooted ambitions. Great to have you back, Tiger. The golfing world is better with you in it, playing like a champion. 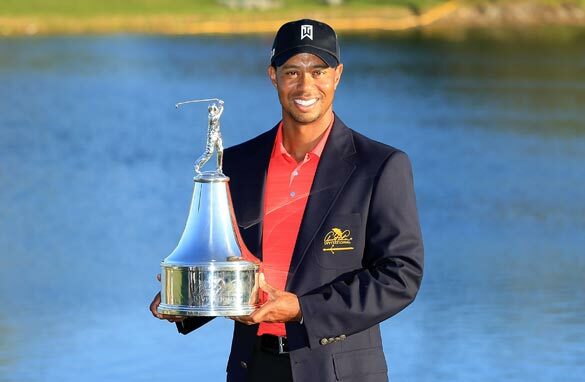 It's so good to see tiger back to winning way,well come back were you belong which is the top. Good to see Tiger back near his best, not because he's Tiger but because golf needs good players. I dislike the fact that golf writers, like the author of this piece, want to put him back on his former pedestal on the basis of one long awaited victory; that is disrespectful to the other players on the Tour, especially the younger ones around the top of the rankings who represent the future! It's time the golfing media stopped craving the past, in which Tiger was all conquering, and started embracing the present in which Tiger might be among a number of top talents who can win a major if their game peaks at the right moment. As we've seen during Tiger's title drought, golf is infinitely more interesting when more than one man can win.Tiger has put the past behind him, hopefully you golf journos can do the same. Tiger, is the reason for my wife and I picking up the golf clubs. Even, when times weren't so great...we both had faith for both him and his family. Tiger is important to the golf community. I have this to say...."Way to go Tiger...keep it coming"
Tiger congrats wish u all the best. Well done brother Tiger Woods. Keep lifting your game and disappointing the naysayers. Congrats. all his cylinders r firing, hope his pistons stay quiet as promised!!!!!!!!!!!!!!!!!! Hey, SI, I thought my comment expressed a fair sentiment, but today you are looking for a certain kind of praise only? OK, you want praise for the man? Great job, Tiger, an inspiration for us all. Outstanding. A man who fights adversity, and an example to my children. First, what could Nike do with Tiger? Should they address his rosnsgtesairns or ignore them. The latter would leave lingering feelings about Tiger, tarnishing the Tiger/Nike brand for a long time. The former, painful now but maybe redeeming later.So, they chose the former. Now, what did the ad say?A sour faced Tiger, being asked by his dead father what he did wrong. And what he learned from his mistakes Since Earl's passing we have seen the human side of Tiger (injuries, infidelity, etc), and now he's trying to rebuild his brand. What better way to do it then to bring back his dead father to talk to him, not scorn or ridicule, but ask as a parent what he did wrong and what has he learned from this process.Third, what did the ad do? It was controversial, something that brought Tiger to the forefront again but put the blame solely on Nike. It was released just before his comeback at the Masters, and I think Nike was hoping Tiger would win or at least make it close.This is a process, rebuilding a sports icon isn't something that is going to happen overnight. I think it was an interesting and experimental piece of marketing trying to rebuild a brand. This will be an interesting case study to watch and see how Nike handles this part of their brand. One win does not a come back make. while tiger has been away we are discovering that there are others equally if not better able to play the game. SI and the sports media in general: cover the leaders not the guy in 42nd place. When tiger is on the leaderboard cover him if not cover the leaders.